The world is in constant flux—this handy book helps make sense of it. From business cycles to budding trends, models make sense of a world that never stops spinning. 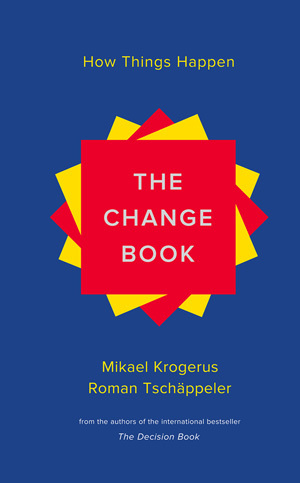 The Change Book delivers 52 simple and effective models—each with a visual component—about how change happens. Drawing on myth-busting theories and breakthrough discoveries from thinkers of all stripes, Mikael Krogerus and Roman Tschäppeler, authors of the international bestseller The Decision Book, apply their characteristic wit and knack for the succinct to show what fuels the internet, why empires rise and fall, and why change hurts—but ultimately helps us grow. Whether you’re starting a new job, lobbying for a cause, or wondering how Jesus would invest, The Change Book is your clever guide through transformations in business, culture, technology, relationships, and more.